Let me begin with an admission. I forced myself to read the first two-thirds of this book and so hated it that I had to put it aside—in the ultimately vain hope that the editor of these reviews would forget about me and the book. What I forgot, however, was that, in the era of computers, nothing ever gets forgotten—the MCLC book review editor emailed to remind me of my approaching submission deadline. I know both editors of this book (Murthy and Schneider), not well, but I like them both and think of them as good scholars. But what I had read of this collection at that point was beyond bad. The good news is that the last third of the book—actually, the last four essays—is much better. So, here is my honest review. First things first—this is the most poorly edited book that I have ever set eyes on: countless typos, impossibly bad grammar, gibberish masquerading as prose, and a totally haphazard inclusion/exclusion of Chinese characters. For example, in the “List of Contributors,” seven of the ten authors are scholars with Chinese or Japanese names, but only one has characters next to his Romanized name. 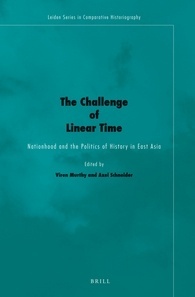 The editors would like us to believe that the central theme of the volume has to do with “linear time,” but only a few of the essays even mention this topic, let alone address it. The only thing that keeps the book together, then, is the binding. The editors’ introduction basically just attempts to summarize the themes of each of the ten essays that follow. Can there be a bigger mistake in East Asian studies than beginning an anthology with an essay by Naoki Sakai? Maybe, but doing this virtually ensures setting the stage with incomprehensibility. As I forced myself to read this essay, an old song by Peter, Paul, and Mary kept floating through my head, “I Dig Rock and Roll Music” (1967); in that classic, they spoof several then-current singing styles, and they note of The Mamas and The Papas: “They got a good thing goin’ / When the words don’t get in the way.” Wow, do the words ever get in the way of this essay—and there’s no music to save anything. I’m sure an editor would have helped this essay, but I doubt s/he could have saved it. Entitled “Negativity and Historicist Time: Facticity and Intellectual History of the 1930s,” a distinctly opaque title never fully explained, Sakai looks at works written by two exceedingly famous historians of thought in Japan, Ienaga Saburō and Maruyama Masao, during the Pacific War. Both of these men are well known for their leftist, pro-democracy political bent in the postwar era, but Sakai attempts to demonstrate that, earlier, both drew on the works of 1930s philosophers whom no one would confuse with the left: Tanabe Hajime and Miki Kiyoshi. This could be extremely interesting, but the words (Sakai’s) get in the way. For example (and this could be multiplied many times): “The second problematic is that of the negativity in terms of which they articulated the issues of subjectivity to the formation of historicist consciousness” (16). Your guess is as good as mine. At one point, Sakai decides that periodization is an issue to be discussed, and he closes his section on the topic thusly: “We must now inquire into the ways periodization works with a view to negativity and subjectivity. For, history is a matter of the individual’s praxis” (21). What could this possibly mean? Two paragraphs later: “First of all, history is invariably a story, and always tied to narration virtually in all the languages.” Infelicities of language aside, does this mean we just make it up as we go? And, when he concludes his next section on history and facticity, Sakai writes: “[I]t is understandable that the historical is grounded in the future-oriented facticity (jijitsu-sei) of the subject, and necessarily mediated by negativity” (25). Doesn’t help much, does it? Earlier in his essay, Sakai makes it clear that he is going to be leveling serious criticism at Ienaga and Maruyama: “It goes without saying that Ienaga and Maruyama are both engaged in the imperialist enterprise of demonstrating the exceptional character of Japan in Asia, of its leadership in the modernization of Asian people” (17). If “it goes without saying,” then what is the point of this kind of postmortem character assassination? He goes on a bit later: “One can hardly fail to recognize that they are, wittingly or otherwise, committed to a certain exceptionalist logic similar in structure to that of Eurocentrism.” Again, “hardly fail to realize” and “wittingly or otherwise” are condescending in the extreme. The same paragraph continues in this vein, but this should suffice. One point Sakai makes is both terribly interesting and important to future scholarship in the intellectual history of the 1930s. Tanabe, Miki, and others were highly critical of what he calls “Japanese fascism,” but that does not mean they opposed Japanese imperialism in Asia. There has been a tendency, he points out, in both Japanese and Western scholarship to conflate the two. When he turns to closer examination of Maruyama’s famous study of Tokugawa-period intellectual history, the ship runs aground again. This book, which two generations of English readers have now been able to access (even if we have reasonably good Japanese) thanks to Mikiso Hane’s 1974 translation, is found wanting in many regards. In a note, Sakai writes: “Hane’s translation facilitates readers’ immediate comprehension, so I have objection to it” (41). Again, an editor would have been helpful here, but more to the point: why is comprehension objectionable? Sakai goes on to opt for utter obfuscation, which is apparently a good thing. When he shortly thereafter tries to trace the root of Maruyama’s historicism to German sources, he claims: “I cannot identify the second context in terms of specific texts, but I am convinced that Maruyama was inspired by Carl Schmitt on a number of issues” (41). This strikes me as argument by innuendo—at best. Associating anyone who has demonstrated firmly pro-democratic, anti-“fascist” ideas over many decades with the likes of the unreconstructed fascist Schmitt without evidence is scandalous. (The bibliography is a mess—47-48). Viren Murthy’s study of Tan Sitong’s famous Renxue (仁學) is unobjectionable. It is not immediately clear why ren in the title is translated as “cosmic love.” This is, of course, an interpretive translation, and possibly an overdetermined one. Murthy claims in a footnote that the usual rendering of “benevolence” won’t work here, because he believes “Tan invokes it [ren] as an ontological ground rather than merely a moral maxim” (49). Why he believes this is not clarified, nor for that matter why an “ontological ground” should lead us into “cosmic” dimensions. Later, he states that Tan understood ren (now mysteriously translated by Murthy as “benevolence”) “as the cosmological ground of the universe” (57). Can something be an ontological ground and a cosmological ground at the same time? I’m genuinely not sure. Murthy goes on: “this substance is extremely difficult to pin down and is peculiarly hybrid.” What does this mean? That it’s a difficult concept to describe? That would be true of any philosophical concept. Does deeming it “hybrid” help us to understand it? We soon, though, see that the hitherto surreptitious viper is “global capitalism.” Now that postmodernism is dead, Marxism is apparently enjoying a rebirth—I would prefer to see it, in line with a subsequent essay in this volume, as a zombie that refuses to die. Somehow then, the young—very young—Tan Sitong was responding to global capitalism. In an effort to illuminate, Murthy writes: “The practice of philosophy and the dialectic of time and history point to deeper structural changes. Following Georg Lukács’ analysis of German idealism, I contend that Tan and Zhang [Taiyan]’s philosophical concepts, such as equality, abstract time, and evolution are intimately associated with the logic of global capitalism” (50). Soon thereafter we meet up with a long quotation from Lukács and a footnote, but there is no such work cited in the bibliography. The text referred to here is dated 1971 and, hence, must be the much belated English translation of Lukács’s famous History and Class Consciousness which will soon be celebrating the centennial of its original publication. (Marxist classics never die, it seems.) Why would Lukács be invoked here? This is, by the way, Lukács the rebel—he would soon be forced into self-criticism and repentance—picking up what he perceived as subterranean Hegelian threads in Marx. But, what could this possibly have to do with late-nineteenth-century China? “One can understand Zhang and Tan as expressing aspects of China’s process of entering the global capitalist system of nation-states” (50). Can one? How? I think only by reading healthy doses of what one wishes to find into the text under scrutiny. In his conclusion, Murthy notes: “We have seen how the theories of Tan Sitong and Zhang Taiyan react to and express different dimensions of internationally circulating discourses related to global capitalist modernity” (80). I’m not sure who this “we” refers to. Did Tan or Zhang live in a capitalist society? Were they at all engaged in anything related to capitalism? I have strong doubts. One final note—in the bibliography, Murthy cites the writings of Zhang Taiyan, about whom he has written a book, and he has the wrong character for Zhang’s name (should be: 章). Again, where were our editors? Axel Schneider follows his co-editor with an essay entitled “Nation, History and Ethics: The Choices of Post-Imperial Historiography in China.” Schneider has long been working on those scholars of the early twentieth century to whom, for lack of a better adjective, we often refer as “traditional” or “conservative.” In fact, he has been working on this so much that this essay is reprinted from a volume published in 2012. Unlike the previous two essays which salt and pepper their paragraphs with German expressions, but who do not appear to know the language, Schneider is a native speaker. This doesn’t mean he necessarily knows what he’s talking about, but we can at least be reassured that he knows the terms he tosses about. This essay is actually a case study of one important but little known historian, Liu Yizheng, who will also be the topic of a later essay in this volume by Ya-pei Kuo. A closer look at the footnotes reveals that, indeed, there have been more than a handful of studies of Liu, but he is still relatively unknown. Schneider begins his account of Liu’s writings with an early textbook to which he contributed, Lidai shi lüe 歷代史略, translated differently in Kuo’s essay, though both mention that it was “an adaptation” (Schneider, 91) “based on” (Kuo, 281) Naka Michiyo’s Shina tsūshi. Schneider gives “1899” as the publication date of Naka’s work, which is wrong. It should be 1888-1890; 1899 was the date of a Shanghai reprint edition. I’m not sure if either Schneider or Kuo actually investigated what they summed up as “adaptation” or “based on,” because Naka’s book was written in literary Chinese. Did Liu et al. simplify the text, modernize the grammar, cut and paste material in the book? As I understand it, the Chinese merely removed the Japanese reading punctuation from the text and reprinted it, but I haven’t studied this issue for some years. It might have been of interest to tell readers that Naka’s book was the first comprehensive history of China written in the modern period in any language, and that it ends with the fall of the Song. I’m beginning to wonder if Schneider or Kuo have ever seen Naka’s original work. The principal reason Schneider singles out Liu for analysis is the centrality of ethics to Liu’s historical sensibility. As he notes: “It seems to me that one of the, if not the most fundamental difference between the development of history as a discipline in the modern West and in China is the position of ethics. In the West, historicism drew reason and ethics into history, thus relativizing and undermining them, ultimately leading to a fundamental epistemological and moral crisis, which is in a way at the root of current post-modern concerns” (102). In China, by contrast, ethics is central to historical concerns. This is an interesting observation, if it is true. “[I]n a way at the root of” is a slippery phrase—it’s like being “in a way” pregnant. In the end, Schneider stakes out a position critical of Joseph Levenson—referring to his book on Liang Qichao of over sixty years ago—which is refreshing. It’s time to move on from hero worship. At this point, the volume under review turns to an altogether different kind of essay. Sun Ge, who seems to have become some sort of Chinese expert on Japan, the basis for which escapes me, offers an interpretation of the writer Takeuchi Yoshimi (1910-1977). Takeuchi was a gifted, leftwing Japanese scholar of modern Chinese literature who wrote extensively on Lu Xun, among other topics. Why this essay was translated (by Murthy) is incomprehensible. It adopts a lecturing, almost hectoring style on “how to write history.” But, it intersperses annoying, chatty verbiage. The one interesting aspect of this piece is how Takeuchi is read and understood in China, especially after the translation and publication of a collection of essays by him in 2005: Jindai de chaoke 近代的超克 (Overcoming of modernity). Sun wants us actually to believe that “the study of Chinese literature and thought was not actually his real goal” (113). Okay, I’ll bite. “He used this study as a medium in order to establish Japanese thought…. [This 2005 book] also presents an outline of a Japanese thinker who shoulders social responsibility while searching amidst reality.” Takeuchi was certainly committed to social causes, and he certainly wrote extensively about Sino-Japanese relations. But, without a doubt, his most influential work was a 1944 biographical study entitled Ro Jin (Lu Xun). What does “searching amidst reality” mean? Does that mean he was a realist? Here’s an inkling of the kind of conclusion-jumping this essay excels in: “on the one hand, he does not consequently simply negate the pan-Asianism of the early Meiji period, although, after 1890, the latter was inextricably linked to invasion in a complex formation, and finally fell into fascist ideology” (114). This sort of reasoning involves a lot of stretching. Why 1890? What happened that made every pan-Asian impulse thereafter “inextricably linked” to imperialism and hence to fascism? In fact, as Sun notes: “some ‘critics of Takeuchi’ grasped the risky part of his intellectual practice and plainly stated that he was a fascist” (115). Something must be wrong with this translation. How anyone could conclude that Takeuchi had rightwing sympathies, let alone was a fascist, is inane. It is one thing to disagree with a fellow scholar—quite another to label his ideas “fascist.” Sun attempts some fancy footwork to avoid disagreeing with such ideas. It is difficult to say whether her legerdemain or those who pronounced Takeuchi a fascist is more idiotic. But, wait, there’s more. Sun is also apparently a philosopher of history: “The process of history is just like a person who plans to take an airplane and encounters a thunderstorm” (117). There have been many statements about what the historical process most resembles, but this is arguably the most bizarre simile on the topic yet. There is more silliness of this sort—actually, lots more—but it’s like shooting fish in a barrel. Fortunately, Sun does not seem to be one of those bent on assassinating Takeuchi’s character, as she notes how instrumental he was in bring two generations of Japanese scholars into the study of modern Chinese literature and history. How she expresses this is a bit odd, though: “if one reads the work of Takeuchi, you will find that his real perspicacity does not consist in telling his contemporaries what they should do…. Rather, his perspicacity lies in his acute sensitivity to the fact that history moves” (119). Glad as I am to know that Takeuchi is not ordering me around, does one need Takeuchi to know that “history moves”? What does this mean? Then, after noting that reading Takeuchi “is the best object to help us train to read history,” she claims: “One could say that in both China and Japan, our intellectual training has not provided us an effective means of dealing with Takeuchi” (120-21). Huh? The next essay by Nakajima Takahiro of Tokyo University also concerns Takeuchi Yoshimi. Unfortunately, it cannot possibly have been read by an Anglophone editor prior to publication. The English is utterly execrable—including inconceivable grammar (e.g., “Confucian norms do not binding the for people” ). Nakajima has a distinct advantage over Sun Ge in that he clearly knows something about the work of Takeuchi and the context in which it emerged, but, as with Sakai, the words get in the way. He also thinks it’s very important to bring Takeuchi into comparison with Walter Benjamin, but it is unclear why. If one can read through the language—no mean feat—there are interesting points hiding here and there that concern how postwar Japanese have dealt with Japan’s war responsibility and the rise of Communist China. Also, the footnotes for this chapter are cited in a fashion unlike all the others, and the bibliography and notes are packed with typos and errors, and there are no characters at all to help. In her contribution to this volume, Susanne Weigelin-Schwiedrzik examines the campaign to criticize Lin Biao and Confucius (in that order) that took place in China in the last years of the Cultural Revolution. She focuses on the recurring—as if from the grave?—theme of “restoration,” though it remains unclear just what the leadership of this movement feared might be restored. Lin Biao and Confucius were both very dead at the time. Attention to the unification of China 2200 years earlier by Qin Shihuang (also quite dead) may have been meant to imply that there was fear of a restoration of decentralized rule, as had been the case prior to the Qin. Was this a crusade to stir up the people to support centralized control over the country by the Party and Mao? Sounds like it. When Weigelin-Schwiedrzik actually turns to discussing the campaign, it is often difficult to separate her recounting the details and presumed motivations of the leadership from her own analysis. For example: “That Lin Biao and Lin Liguo had made plans to assassinate him [Mao] and fled the country had made it clear to him that the 9th Party Congress had chosen the wrong successor” (162-63). Did anyone besides Mao believe this at the time? Does anyone now? In her conclusion, she notes that this campaign “did attract quite a number of intellectuals” (174). Really? Or, were they forced to participate? I kept saying to myself as I read this frequently repetitious essay: Why not come right out and say that Mao had lost his marbles and this whole campaign was insanity run amok? Of course, that might be somewhat less than the proper scholarly style in which to sum things up, but there is the parallel danger of over-intellectualizing this admittedly bizarre affair. We now come to the last third of the book, and it is as if the editors miraculously awoke from sleeping with the dead and began stalking the authors much more closely than before. Liu Long-hsin’s highly focused piece on the PRPH (Popular Reading Publishing House, Tongsu duwu biankanshe 通俗讀物編刊社) in the 1930s addresses a theme all but absent from Western historiography and a fascinating one at that. Many familiar names—Gu Jiegang, Lao She, Fan Wenlan, and Xu Bingchang, among others—are known to us, but their activities in preparing popularized works in Chinese history and culture are much less well known. There is a great deal of detail here, but it is worth the effort, as this is mostly new material. Liu ultimately attributes the decline of the PRPH’s efforts to a lack of money and leftist inclinations that the Guomindang would not brook. There are, unfortunately, a fair number of typos and errors that the editors (if they even saw this essay) either missed or simply passed on. I shall spare readers the typos, but here is a sampling of other mistakes or infelicities: tanci 彈詞 is translated “twang singing” (186)—something like “storytelling accompanied by stringed instrument” might have been better; Yuan mishi (197) should probably be Yuanchao mishi (if what is meant is the Secret History of the Mongols); and all the Japanese terms in the doggerel translated on p. 199 are mistranscribed (the same is true of the one Japanese item in the bibliography)—Chinese characters are only haphazardly included in the text, making it difficult to assess things properly. And, they just keep getting better, at least temporarily. Haiyan Lee’s marvelous essay is by far the jewel in the decrepit crown. To be fair, it would have shined anywhere. Moreover, the zombie imagery she evokes could nicely have provided the motif for this whole volume, but that would have called for some editorial leadership. Lee examines the bizarre background and subsequent exposé of a museum not far from Chengdu, a museum housed in a former landlord’s estate with a horrific “water dungeon” allegedly used for torture. It all could be brushed aside easily as just one more ghastly tale from the socialist crypt, but Lee uses it to develop a much more nuanced and meaningful critique of state socialism in China. And, it’s devastating. Employing theory as a condiment rather than as a blunt object, the ghoulishness of the whole tale—I shan’t recount it here, because Lee’s beautifully written account deserves to be read itself—begins to make larger sense. She is especially strong in this early segment in demonstrating how the Communists turned class status through the chengfen 成分 system into a heritable trait. What she doesn’t mention is that China had not had identifiable classes (Marxist or otherwise) for the millennium preceding the Communist revolution. With the chengfen system, classes became castes, a status assigned at birth that simply could not change, and class antagonism became a kind of racism. After 1949, especially after collectivization, putative former landlords would no longer have been wealthy, blood-sucking vampires, but they (and their offspring) were repeatedly brought out—like the living dead—for humiliation, torture, and often execution. I have not done justice to this marvelous piece of scholarship, but I shall return to the imagery it invokes below. This essay is the best scholarly critique of Chinese socialist ideology that this reviewer has ever read. Nuff said. The last two essays in this volume are let downs, but most anything would have been after Lee’s piece. Hon Tze-ki looks at the traditionalist scholars associated with the journal Guocui xuebao 國粹學報 in the early twentieth century, and he notes their distinctive use of guangfu 光復 (restoration) and geming 革命 (revolution). When Zhang Binglin, for example, called for a restoration, he meant the ouster of the Manchus and a return to Han Chinese rule. Because these guys were not strict Confucians, like many of their opponents in the reformist camp, they looked for cultural sources among other ancient schools and rediscovered the zhuzi 諸子 (non-canonical) philosophers of the late Zhou. This is an interesting and important point, but it is hardly news. Shimada Kenji made it over half a century ago, and he was preceded by other Japanese scholars writing in the 1920s. Still, Hon brings to light a number of nearly forgotten guocui scholars who deserve our attention and whose writing style is often difficult to penetrate. This volume’s final piece by Ya-pei Kuo concerns (as noted above) Liu Yizheng and in particular his Zhongguo wenhua shi 中國文化史 (History of Chinese culture). Kuo devotes considerable space to what Liu meant by wenhua (281-82), because “culture” as we now use that term doesn’t cover the broad range of the Chinese term at that time. Interestingly, this breadth of meaning closely parallels Naitō Konan’s use of the term at the same time; in his view, the history of China was the history of its culture. A closer look at sources of knowledge or influence, even across political borders, would have been instructive here. When Kuo starts to unpack some of Liu’s ideas, though, I for one would like to have seen some critique applied. For example, Liu argued that China’s “first national trait was moderation”—zhong 中, and, for that reason, the land acquired the toponym Zhongguo. There is, of course, not a scintilla of evidence for such a weird statement; if there is, it would have been good to mention it. Later, we learn of his idea that China gained its balanced name on the basis of a unanimity of “‘all citizens of the nation’” (289). How would such a poll have been taken during the Zhou dynasty? Kuo should get points, though, for trying to engage the putative theme of the volume via Liu Yizheng’s historical views. How to ultimately assess this volume? Most of it should never have been published. It is increasingly becoming apparent that Brill does not copy edit. That should not be understood as a license to publish anything written in the Roman alphabet. Certainly, one should not abdicate responsibility for work that will go out into the world under one’s name, editorial or authorial. Sadly, the really good work in this book—first and foremost, that of Haiyan Lee—may get lost in the muck and mire of the rest. One theme that would have been good to treat thematically throughout the essays is the zombie-undead one that Lee handles so nicely. Many years ago, I mentioned to the late Fred Wakeman that I had actually read a work that dated the emergence of postmodernism to 1972. He responded (as best I can remember): “[expletive deleted], that’s just when Marxism died.” The idea occurred to me that Marxism, like the religion that it has become, may be the undead philosophy of our time. When postmodernism arose and most thought Marxism dead and gone—and then especially after the collapse of the Stalinist dictatorships around the globe and melioration of all but one or two—we entered the era of the culture wars. It was not a happy time in the academy with the advent of political correctness, but at least the peoples of Eastern Europe and elsewhere seemed to be headed for better times. But, now that postmodernism is moribund or perhaps dead and gone, zombie Marxism is on the rise, stalking the world, reminding everyone to never forget class (who would? ), that “global capitalism” is an ever-present threat, appearing in rustification theme restaurants in China, and the like. Might I suggest that everyone dust off their tattered copies of One-Dimensional Man by Herbert Marcuse and (re)-read it? Either that or rent Love at First Bite (1979), starring George Hamilton.